If this winter is anything like the last one that brought more than 50 inches of snow, it’s going to feel like forever before athletes can return to the great outdoors. But cold temperatures and howling wind don’t have to force sneakers and equipment into storage for four months. There’s no shortage of indoor sports facilities across Long Island available to those looking to stay active year-round. New to a sport? Most of these places can set up clinics to master the basics. It’s time to keep routines going. When the local playground is covered in snow and ice, or if fingertips go numb during jump shots, it’s time to embrace the coziness of indoor basketball. NorthSport Athletic Facility has two full-length courts. The sparkling facility is home to the Suffolk Lightning AAU Club and conducts adult and youth leagues, open play, camps, clinics, tournaments and training sessions. Manager Artie Beckmann said the eight-game men’s winter league season, which costs $675 per team, begins in December. “We have three different divisions based on level of play and each game is worked by two certified officials.” Open play times vary based on court availability and cost $5 per person for a 2-hour session. Rent a court for $75-100 per hour. Offering state-of-the-art baseball and softball pitching machines, plus an enclosed throwing area for pitchers and catchers, Baseball Plus caters to players of all ages and skill levels. The facility opened in 2008 and operates six batting cages for baseball and four for softball. “Winter is our busiest time,” employee Jonathan Pagan said. “We have rentals by the half-hour and the hour, as well as token-operated machines.” Groups can split the half-hour and hourly rentals ($28 or $48) and for $2, batters can opt for an 18-pitch, token-operated machine that delivers pitches at varying speeds of up to 90 mph. The in-house shop boasts one of the largest baseball/softball stores on Long Island with a wide selection of equipment and other sporting goods. If lugging a bag of clubs through an airport on the way to South Carolina isn’t in the plans, a trip to Spring Rock Golf Center can keep a golf swing up to par while local courses are blanketed with snow. 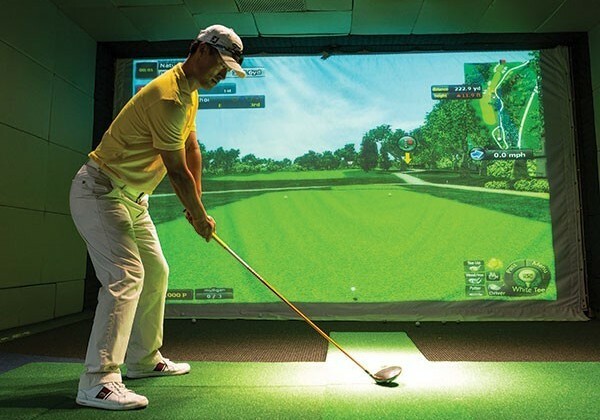 The year-round facility offers an indoor simulator with many famous courses to experience, including Augusta National and Pebble Beach. “It takes about an hour to complete a course on the simulator,” said manager Heidi Kang. “I haven’t met anyone who hasn’t enjoyed it.” It also features a large 2-level, outdoor driving range with 100 individually heated booths, a putting green, sand trap, miniature golf course, repair and pro shops. The simulator costs $35 per hour and reservations are required. The multi-sport facility with 40,000 square feet of field space is gearing up for its popular winter adult men’s soccer league beginning in December. General manager and player Nick Nowakowski competes in the Open Division and Over 30 leagues. “We’re in our sixth year and expecting close to 30 teams in the winter league,” said Nowakowski, who said Coastal runs leagues year-round. “It’s competitive, fun and great exercise.” Each team plays 10 games and the top 8 in each division advances to the playoffs. Games consist of two, 25-minute halves on a 50-x-35-yard field. Coastal also offers adult and youth lacrosse and clinics for soccer, softball and baseball. Entry fee is $1,395 per soccer team. Established in 1972 and open year-round, the Carefree Racquet Club can keep an athlete and his game moving in the right direction until spring. The club features seven indoor air conditioned hard-surface courts, two racquetball courts, a half-court basketball area, a pro shop, sauna, locker rooms, weekday child care and a staff of eight certified tennis professionals. Private and group lessons are available in addition to hourly and seasonal court rentals, which start at $40. “We’re a non-membership operation and the rates are the same for everyone,” said manager Kathy Miller, who noted adult leagues for men and women are all the rage and cover 30 weeks. Carefree’s 15-week Learn and Play program is popular for newbies ($475). They boast a 4-to-1 student-to-instructor ratio; each weekly session includes a one-hour lesson and 90 minutes of practice time.